Steam Distillation duplicates nature’s hydrological cycle of evaporation, condensation and precipitation. The hydrological cycle is where virtually all fresh water on the planet comes from. The process is simply this; the Sun provides heat to the very contaminated water in the ocean, which causes the liquid water to turn into vapor; as soon as the water turns from liquid to vapor it lets go of the contaminants that it was holding. The water vapor then rises and condenses into clouds. The clouds cools down and the water precipitates and the rain falls. This water started out extremely contaminated and finishes as very pure water. The process of steam-distillation duplicates this process by taking tap water and adding heat to water. The liquid water changes into water vapor and leaves any junk behind in the boiling chamber. 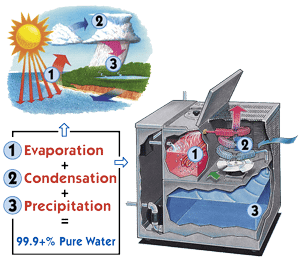 The pure water vapor then rises and is moved into a separate chamber and then it’s cooled back down into liquid water. FIVE Advantages of Steam Distillation. | Where on the curve is your water?.